What life with an Amazon Echo is like after the novelty wears off. How people actually use their Amazon Echos after the novelty wears off. 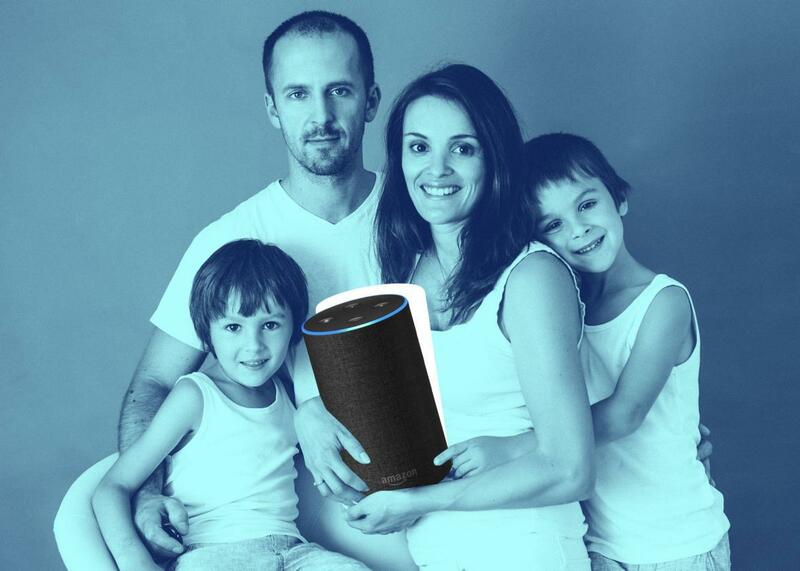 Happy family with Amazon Echo. Sales of Echos were up nine times over their sales for the previous year, marking what looked like a turning point for Amazon’s smart speaker device, which first hit the market in mid-2015. (Amazon controls 75 percent of the smart speaker market.) But getting something as a Christmas present isn’t the same as living with it every day. What does home life look like now, a year after Alexa joined the family? A few things are for sure: She’s tested relationships. She’s become like a sibling. She’s gotten people used to talking to a disembodied virtual assistant. In a few cases, she never got plugged in. In short, she’s changed everything and nothing. The first phase of Echo ownership, especially when you’ve received one as a gift, is skepticism. When John Hebert, a car-dealer manager in Rosenberg, Texas, got his, “It didn’t even come out of the box for the first two months,” he said. Shaunacy Ferro, a writer in Brooklyn, had a similar reaction when she received one from her father. “When I opened it, I was like, ‘Oh my God, Dad, this is such a Dad present,’ where it’s like this useless tech thing that I never wanted,” she said. Wes Swenson, who lives in St. George, Utah, and works in technology, followed much the same trajectory. He wanted to test out an Echo, so he bought one when the price for the Dot model went down to $49. “I didn’t have a lot of expectations as to what I would do with it,” he said. A couple of years later, he still has that original Dot … plus five Echo Shows (the model that features a touch screen), one in his kitchen/living room and one for each bedroom. “I didn’t want anybody to feel like they were getting a room without one,” he said. “I don’t know that my husband has quite accepted Alexa,” Marilyn Primiano, an attorney in Washington, agreed. For Sturgeon, the biggest adjustment was learning to talk to Alexa. “It was kind of a little hump we had to get over to say out loud, ‘Alexa, will you please tell me what the weather is?’ ” she said. “When you’re in a house by yourself, which I am as a self-employed [person] a lot of times, talking to myself out loud is just not a thing I do.” She’s gotten better about it, but it still strikes her as odd occasionally, such as when she was feeding her dog late one recent night and had Alexa reorder dog food. “There’s just something about 2 o’clock in the morning, talking to this machine and ordering something. It feels different,” she said. The voice-driven operating system can also make using Alexa’s skills (essentially, its apps) a challenge. “I’m a bit nostalgic and I wanted to listen to The Shadow, the old 1930s radio show,” Swenson remembered. “Lo and behold, they had a skill for that. The thing is, though, I feel like I need a notecard by the [Echo] to give it those commands. Because you do have to use somewhat specific language with it to open up a particular skill. I couldn’t just tell it, ‘Play Shadow radio podcast.’ ” Ferro’s experience with a skill designed to keep her household on top of whether the cat had been fed went about the same way (poorly). “It was very specific about what you had to say to get it to work, which ended up being a problem for my roommates,” she said.